It was a moment not really meant for public consumption, out of sight of the audience. I only witnessed it because I was sitting off to the side of the stage – which made it all the more meaningful. It wasn’t part of ‘the show’ but a private moment, yet sums up the entire mood of that night, the last date of a 28 city tour across Europe in which Riverside has reestablished themselves after the tragedy of the death of guitarist Piotr Grudziński in February of 2016. And then it happened. Mariusz turned to his immediate right and raised his eyes skyward, with a look that simultaneously summed up all of the exhaustion and tragedy of last year (Mariusz also lost his father, among other things), yet simultaneously seemed to say, ‘Piotr, we did it!’ It was truly one of the most honest emotional moments I’ve ever experienced at a rock show. I have chills now just writing about it. From the beginning, it was clear that this would be no ordinary evening. The recording of Riverside’s intense yet ambient “Eye of the Soundscape” set a somber tone in the minutes before the three surviving members – Mariusz, keyboardist Michał Łapaj, and drummer Piotr Kozieradzki – simply walked onto the stage bathed in white light to a roaring welcome that acknowledged the audience’s joy at the band’s survival. After a heartfelt greeting from Mariusz, the band broke into “Coda,” a piece that in its original form (on 2013’s Shrine Of New Generation Slaves album) was merely a reprise of the song, “Feel Like Falling,” lasting under two minutes, but here was rearranged as what has become known as the “Dark Version” with the three musicians extending and improvising on a funereal metallic drone – particularly spotlighting Łapaj, a fantastic and truly underrated keyboardist – until joined by guitarist Maciej Meller. This set the tone for much of the show. Older songs were extrapolated, rearranged, and had an element of improvisation that is new to the live Riverside experience. “The Depth of Self-Delusion,” for instance, was more than twice the length of its studio counterpart, and included a bass solo worthy of Rush’s Geddy Lee or Yes’ Chris Squire. But this was no jamband show either. “Lost (Why am I Frightened of a Hat? )” was performed in the arrangement originally imagined – as a much quieter song, with Mariusz on acoustic guitar. It prompted an audience singalong that was a highlight, and was one of several times that Mariusz was literally moved to tears. Of course, some songs demand the precision of the original arrangements –”Caterpillar and the Barbed Wire” and “Saturate Me,” for example, were executed flawlessly. Guitarist Meller, formerly of Polish Prog Rock legends Quidam, is a versatile player with the excellent taste to know when to simply duplicate a memorable Grudziński solo (“Conceiving You”) and when to put his own stamp on a song (“Coda” and “Lost”). Unsurprisingly considering his history, he’s overall more of a progressive rock musician than Grudziński, but when the song requires him to bring out the heaviness – especially on old favorites such as “Second Life Syndrome” and “02 Panic Room” – he delivers. The final song of the night was another rearrangement (known as, you guessed it, the “Bright Version”) of “Coda,” this time played in a arrangement that replaced the darkness of the one that opened the show with a mood of new hope and optimism, symbolizing the transition of Riverside from the darkness of 2016 into a positive future. And if I know anything about Mariusz Duda, that symbolism was entirely intentional. 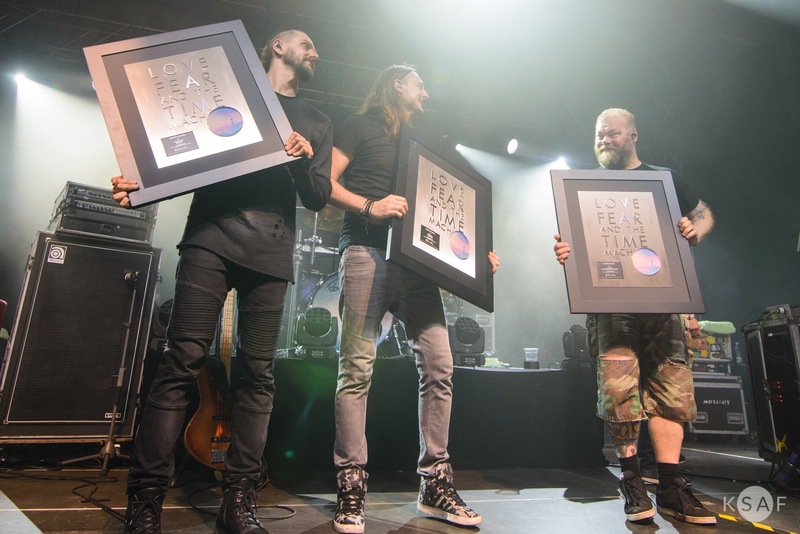 As if to underline that positivity, before the final song, the band were presented with Gold Records for the Love, Fear And The Time Machine album by the Mystic Production record label. It was perhaps the perfect way to conclude the first era of Riverside, at the final show of the tour which reestablished the band and has given the necessary momentum to carry them forward into album #7, which may well be the one to internationally propel the band into the same stratosphere as peers such as Steven Wilson and Marillion. Personally, I can’t wait. The show was opened by Gdańsk’s Sounds Like The End Of The World, an excellent instrumental progressive rock-metal outfit with two albums to their credit. Their music consists of very tightly arranged compositions, executed by a two guitar assault with influences that seem to range from obvious touchstones like Thrak-era King Crimson to unexpected ones such as Sonic Youth and at times, even The Cure. However, unlike Crimson, their stage presence is less scientists-performing-musical-experiments and more Headbangers Gone Wild. Poland clearly has a love for progressive instrumental guitar rock, as evidenced by the success of bands like Tides From Nebula, and Sounds Like The End Of The World are a worthy addition to the genre.